Introducing the most dazzling mixture of sunset shades. 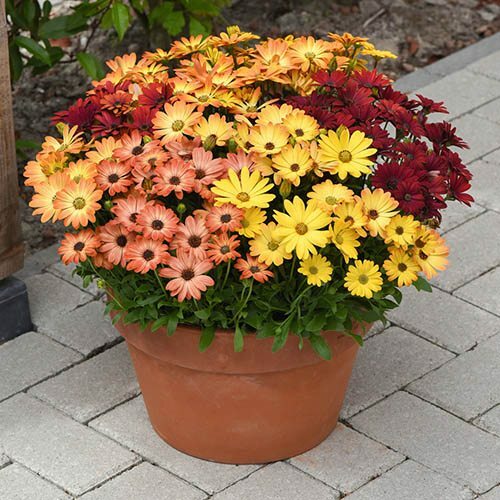 A gorgeous mix of shades, just like the colours of the setting sun, the daisy-like flowers of Osteospermum 'Akila Sunset' will fill your garden with fiery colour. From spring to autumn, the uniform, compact plants will tolerate light frost as well as heat and drought - making them the perfect variety for garden borders, mass plantings and other container displays. A breeding breakthrough, plants produce multiple branches without the need for tedious pinching, the massed heads of bloom will fill your pots much more than traditional varieties and will attract bees and butterflies into your garden. Wonderful shades of yellow and gold, rose-red, plus salmon, apricot and orange, are the perfect summer combination and their daisy-like blooms are produced in profusion. Ideal for containers and borders, osteos are sun lovers and grow best in moist, well-drained soil. Easy to grow and needing very little in the way of aftercare, your plants are sent as 12 x jumbo plug plants, ready to pot up and grow on. Supplied as 12 x jumbo plug plants, ready to pot up, grow on and plant out when all risk of frost has passed. Plant in reliably moist but well-drained soil in a sunny position in beds, borders or containers.